TV Action Comics - buying and selling on the internet. TV Action Comics first issue was on 1st April 1972. It was a rebranding of the very successful Countdown Comic which had picked up the Gerry Anderson strips from TV 21 and Joe 90, and also ran an immensely popular Doctor Who strip. 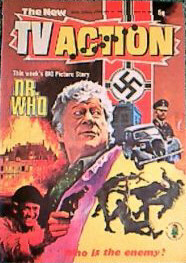 TV Action ran for 72 further issues before its demise on 15th September 1973. Copies of Countdown and TV Action are prized for the Gerry Anderson and Doctor Who related strips and stories.